A forest a day … when will the logging of our spectacular forests actually cease? A cloud of concern hangs over 563 000ha of forests that have been independently verified as world heritage and national heritage value. If a deal is reached between the forestry industry and some environmental groups in Tasmania, the question remains; when will the logging of forests that are ear-marked for protection actually cease? In the past two years the State and Federal Governments have failed to deliver on their promises of protection for Tasmania’s high conservation value forests. This inadequacy has been due to the influence of the forestry industry, with a major player being Ta Ann. In addition Forestry Tasmania (FT) has failed to perform forward rescheduling out of the forests nominated for protection. Deputy Premier Bryan Green, who is the minister responsible for overseeing FT, has played a weak role in directing the agency to reschedule. All of this had led to the ongoing destruction of forests that should have been provided the protection of a moratorium over a year ago. It is a pressing concern for environmentalists, especially when Bryan Green only this morning stated on ABC radio, that securing wood supply is the priority for any agreement on forests, knowing that this argument has been used to justify continued logging of areas previously promised protection. What Tasmania needs is a strong conservation outcome, in order to adequately protect our unique environment and endangered species for the future. The independent verification group, endorsed by the government, made it clear through their research that protection of these forests is critical. Conservation science needs to be a driving force behind the forest agreement, not sidelined while industry demands are given precedence. 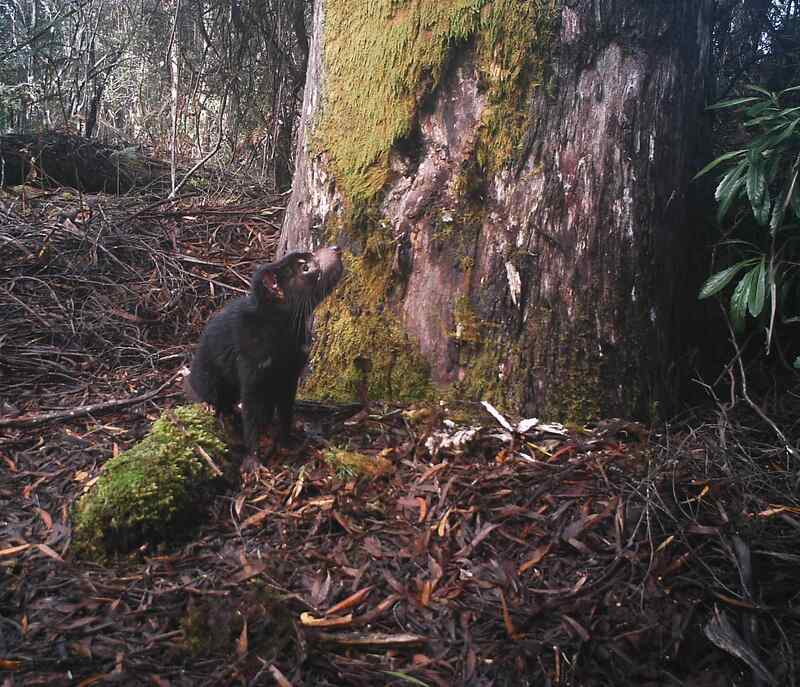 Endangered Tasmanian devil in the threatened Tarkine forest. Right now there are forests being logged that have been proven to be core habitat for a range of endangered and threatened species. These are the species that we risk losing if these forests are excluded from protection. And so our blog over the past month in July has been a unique opportunity for people around the globe to bear witness to the ongoing logging of Tasmania’s world heritage value, globally and nationally significant forests. Never before has there been an intensive account of the areas being logged or those areas that remain threatened in Tasmania’s forests. Throughout July we have documented 29 logging coupes in forests that were due for protection under the moratorium but are on logging plans instead. Of these, 15 have already been impacted by logging. This is just one small sample of significant forests around the state that are on the logging schedule right now. The end of our Forest A Day project occurs at a time when the future of 563 000ha of independently verified forests is uncertain. There are great concerns about whether adequate protection will be provided for these areas. In particular, there is no certainty that Forestry Tasmania has done the forward planning required to reschedule out of the proposed protected areas. If not, will Tasmania’s high conservation value forests be facing another 9 – 12 months business as usual onslaught of industrial scale logging? And what impact will this have on these areas that have been recommended to be our future national parks and world heritage areas? Protection for these forests is long overdue. Not only are there concerns as to whether Forestry Tasmania have begun the rescheduling work needed to cease logging in the verified high conservation value forests, but in addition, there are uncertainties regarding wood supply modelling as Forestry Tasmania are the designated architects of modelling future wood supply to industry. Currently they are entrusted with providing a solution for wood supply that will enable the protection of the 563,000 hectares of forests, despite their interest in the continued control of as much forest as possible for logging. At the end of all of this, will verified high conservation value forests inside the 563,000 hectares continue to be decimated by logging in order to meet wood supply demands? Moreover, it is Ta Ann who have played a key role in driving the ongoing destruction of those forests nominated for protection. Our question then is this: will Ta Ann continue to source wood from forests that have been verified as world heritage and national heritage value? And will Ta Ann’s wood supply continue to be a key driver in the destruction of Tasmania’s forests, resulting in significant high conservation value forests being excluded from the recommended protection? Tasmania has seen promises of forest protection made and those promises broken throughout this process. Will we see another repeat of the so-called “conservation agreement”; an agreement that actually allows further logging of areas due to be protected? Tasmania’s high conservation value forests have been compromised enough over the past decades. Now it is time for real protection. CLICK HERE to take action now for Tasmania’s magnificent forests. For more information about the ‘A forest a day’ project, which has been a collaboration between Huon Valley Environment Centre, Still Wild Still Threatened, The Last Stand, Markets for Change and Code Green, please click HERE. Posted on July 31, 2012, in A Forest A Day. Bookmark the permalink. 1 Comment. An outstanding series. These documents form an important record. They tell us what is actually happening in our forests which are supposedly protected in the interim. Thank you to all who took part in the project. It is a great achievement. Instead of financially propping up our FT Govt Business Enterprise, instead of subsidies to businesses and instead of throwing money willy nilly, why not get out of native forest logging and retrain timber workers as members of an expanded Parks and Wildlife service? We want permanent solutions, not this train wreck of an industry, which degrades a precious asset while haemorrhaging all over the state. Thank you all, Observer Tree included, for shining light on what is happening in our HCV forests.